In a previous tutorial, we looked at how to move photos between Photoshop documents, an absolutely essential skill for blending photos together since we need both images to be inside the same document before we can do anything interesting with them. In that tutorial, we covered three simple ways to move photos - "drag and drop", the Duplicate Layer command, and "copy and paste" - that work with all versions of Photoshop. In Photoshop CS4, though, Adobe made some rather big changes to Photoshop's interface by introducing tabbed document windows. The classic floating document windows that have been part of Photoshop since forever are still around, but Adobe has been making a big push lately to create a consistent looking interface across all of its products so that anyone who's comfortable with using Photoshop, Illustrator, InDesign or any Creative Suite program can jump right into any of the other programs and feel at least somewhat familiar with it. That's great for Adobe, but possibly not so great for anyone who's upgraded from an earlier version of Photoshop and suddenly finds that dragging and dropping photos between documents no longer works. Or at least, no longer works the way it used to. 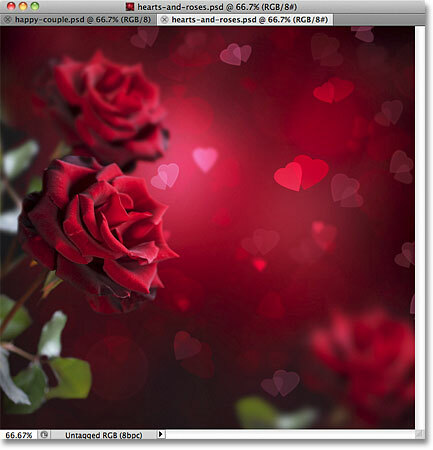 As we'll learn in this tutorial, you can still drag a photo from one tabbed document into another. It's just not quite as intuitive as it is with floating document windows. I mentioned a moment ago that floating document windows are still an option in Photoshop CS4 and CS5, and we can tell Photoshop which type of interface we prefer to use in the Preferences. On a PC, go up to the Edit menu in the Menu Bar along the top of the screen and choose Preferences. On a Mac, go up to the Photoshop menu and choose Preferences. You can also get to the Preferences with the handy keyboard shortcut Ctrl+K (Win) / Command+K (Mac). Either way opens the Preferences dialog box. Select the Interface category on the left. The "Open Documents As Tabs" option in Photoshop's Interface Preferences. 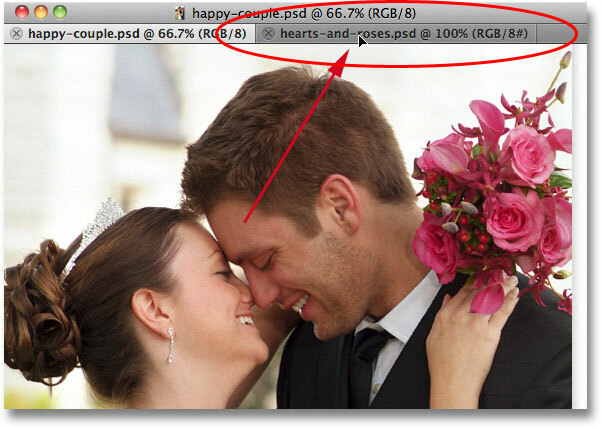 With his option selected (checked), Photoshop will open all images in tabbed document windows. If you prefer floating document windows, uncheck this option. In that case, you'll also want to uncheck the option below it, Enable Floating Document Window Docking. This tutorial assumes you're using the tabbed document window interface. And now, let's see how to move photos between them! 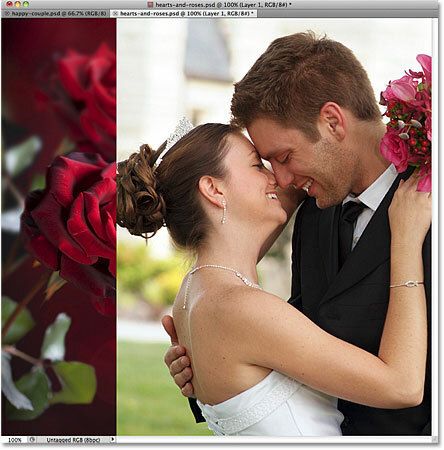 One of two photos open in Photoshop using tabbed document windows. To switch between the photos, we need to click on their name tabs at the top of the document windows. The tab of the currently active document will appear highlighted. I'll click on the second photo's name tab to select it. Click on the name tabs at the top to switch between images. With floating document windows, where we could see both images onscreen at once, dragging one photo into the other photo's document was simple. But how do you do it when you can only see one photo at a time? Well, it's not the most intuitive thing in the world, but it's actually very easy. Select the photo you need to move by clicking on its tab. Click inside the photo and drag it onto the name tab of the other document. Keep your mouse button held down and drag from the name tab into the second document. 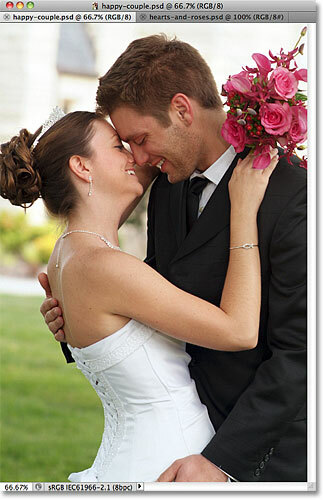 Release your mouse button to drop the photo into the second document. 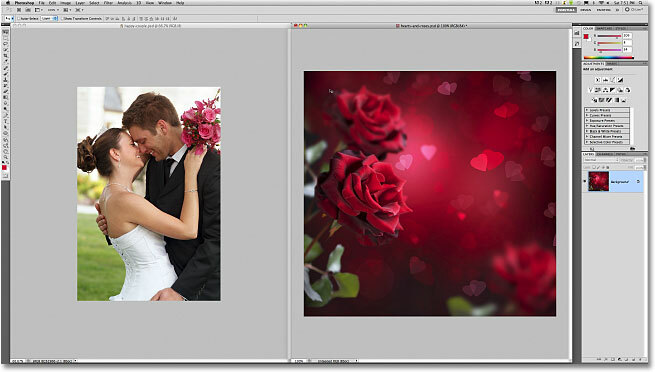 The Layers panel showing both photos, each on its own layer in the same document. By default, tabbed document windows only show one image at a time, but there's a way to change that and make dragging and dropping between documents easier, which we'll look at next! The Arrange Documents icon in the Application Bar. Selecting the 2 up vertical layout. The 2 up vertical layout lets us see both photos at once. Click and drag the photo into the other document, just as you would with floating document windows. Holding the Shift key before releasing my mouse button centered the photo in the document. 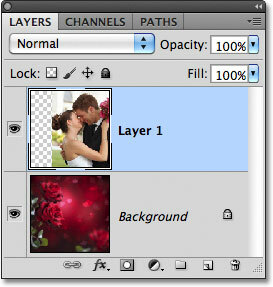 The Layers panel again showing both photos, each on its own layer. Clcik again on the Arrange Documents icon, then click on the Consolidate All option. 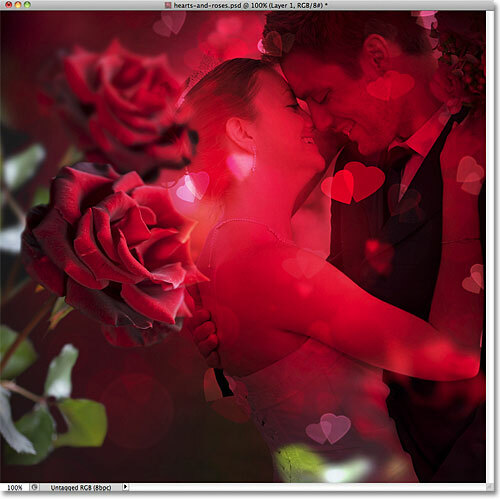 The Layers panel showing the Overlay blend mode and the layer mask thumbnail. And there we have it! That's how to move photos between documents using the new tabbed document windows interface in Photoshop CS4 and CS5! Even though dragging and dropping photos between documents is a bit different with tabbed document windows, the other two methods we looked at in the previous tutorial - the Duplicate Layer command and copy and paste - can be used no matter which type of interface you prefer. Be sure to check them out in the previous tutorial if you haven't already. 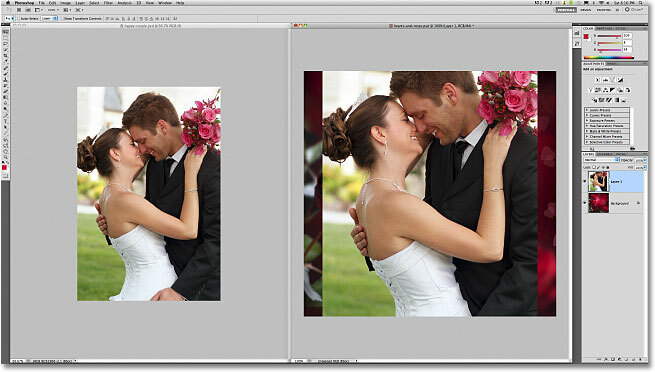 Visit our Photoshop Basics section to learn more about the basics of Photoshop!